PFI is a Freedive Certification agency with instructors all over the world who teach PFI's system of Freedive Training. PFI Headquarters recruits some of these instructors to teach programs offered by PFI. These instructors are known as PFI staff instructors. John is a PFI Intermediate and Breath-Hold Surf Survival Instructor based in San Francisco, California. He offers individualized coaching sessions and specialized classes such as Safety for Abalone Diving and Spearfishing. John is a two-time U.S. National Record holder for the freediving discipline of Dynamic No Fins (DNF) and has represented USA Freediving at AIDA World Championship events in Belgrade, Serbia (2015) and Turku, Finland (2016). Despite being raised in Southern New Mexico, Ryan's love for the ocean began at an early age. His first experience with the sea was not until 2001, when he moved to Maine. From that moment, he knew the ocean would be a vital anchor in his life and he soon became scuba certified. Unfortunately, due to the high cost of scuba equipment, the sport was out of reach for him. Instead, he went snorkeling (with no wetsuit) in the waters of the Atlantic Ocean where cold became his friend. In 2008, he joined the Navy and experienced “warm” water for the first time during long training swims in San Diego Bay. The following year, Ryan transferred to Pensacola, Florida for Aviation Rescue Swimmer School. It was there that he was introduced to spearfishing and freediving and, upon his return to San Diego, he enthusiastically pursued both. It wasn't long before Ryan knew he wanted to teach others. 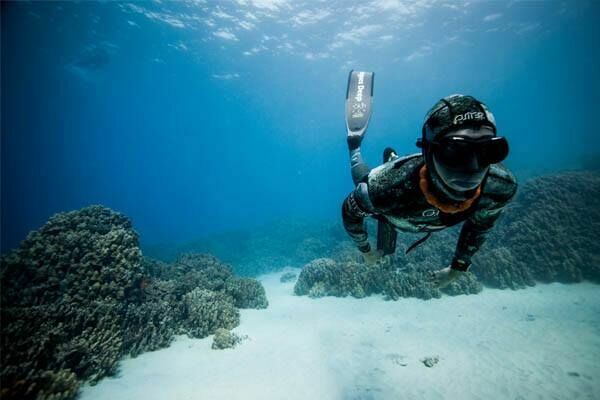 After a move to Guam (where he discovered what real warm water is), he met his two dive partners and they started a spearfishing team, Leagues Deep. Ryan did his PFI Instructor training in Hawaii, parted ways with the Navy, and is again enjoying the cold waters of New England. After 5 years with PFI, he's excited to offer his expertise to others who are interested in learning this dynamic and challenging sport.